If a white man commits what is indisputably an act of terror, the “t” word is stricken from the record. Only Muslims whom western interests don’t like are ever referred to as terrorists. On Friday, July 22, 2011, a bomb rocked central Oslo, Norway, killing seven people. A short time later more than 80 young people were shot to death at a labor party youth camp near that city. Anders Behring Breivik, a white Norwegian national, was apprehended and confessed to committing the bomb attacks and the shooting deaths. Breivik is a self-described right wing Christian nationalist, who regularly railed against Islam and the immigration of people of color to Norway. 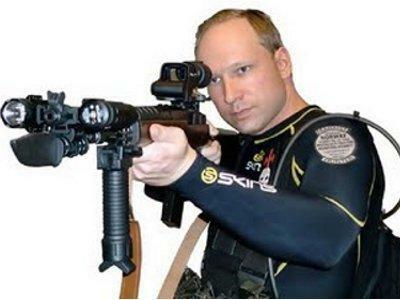 Breivik was a fan of anti-Islam websites and he was a member of his country’s anti-immigration political party. As events unfolded on July 22, the worldwide corporate media did what it does best, misinforming millions of people around the world. Instead of stating the truth, that the assailant or assailants were as yet unknown to authorities, they began to conjecture, that is to say lie outright, about the identity of the perpetrator. So-called terrorism experts immediately appeared in print, online and on the air, and depending upon their favorite choice of words, made claims of radical, Islamist, or jihadi involvement. In the worst such example of the day, a group which may not even exist, Ansar al-Jihad al-Alami, was erroneously credited with having claimed responsibility for the killings. The full gamut of obeisance to government interests and to racist beliefs in the superiority of white people, were on full display. Once the false reports of Muslim involvement ended, and the identification of a white Norwegian as the suspect was made, the word terrorist suddenly disappeared from reporting. Apparently there is a tacit understanding that white people are never to be referred to as terrorists, even when they detonate bombs and shoot nearly one hundred people to death in a well planned and deliberate act. The word terrorism has been rendered both useless and meaningless because it is used to let one group of people off the hook, no matter how awful their actions. There is some twisted logic going on here. If Breivik were to be called a terrorist, then the actions of the United States and other governments could potentially be labeled terrorist as well. Starvation in Somalia is the direct result of United States intervention and use of Ethiopia as a proxy to destroy that nation. Drone attacks in Pakistan and Afghanistan have killed thousands of people. These acts can rightly be called terror attacks, but language is twisted to meet the needs of an agenda which serves one powerful group of people. Torture isn’t torture if committed by the United States government. “Harsh interrogation techniques” is the term that the New York Times and other media outlets use instead. Breivik is not only not referred to as a terrorist, as he clearly ought to be, but his whiteness is always a part of the story too. There are endless references to his blond hair and his green eyes, in short to his whiteness. Breivik’s race is an issue for him, in a country with a white native population now bringing in many immigrants of color, but the corporate media are joining him, awe struck by the appearance of the Nordic mass murderer. There will, it seems, always be an unhappy white man some where on the planet who gets fed up and starts killing people because of some sort of grievance, whether real or imagined. He may be upset with the government in the United States and blow up a federal building, or crash a plane into an IRS office, or be angry because his government permits too many brown skinned people to occupy what he thinks should be an all white enclave. That man will always be described as a lone nut with no ties, no connection to his society. His actions will be called an aberration. Of course, people of color get no such consideration. They are seen as part of pathologies, dysfunctions and political agendas which are directly blamed for their misdeeds. Breivik is condemned for doing what governments do all the time. Obviously he should be condemned, but so should the presidents and prime ministers who make war and kill thousands of people. Breivik is a terrorist and so are the many of the leaders who expressed shock and horror about his actions. Yes, the blond and green eyed can be terrorists too, whether they act alone or in concert with other heads of governments.